"It was 25 years ago today" that I sat in Carson's guest chair. Today's post follows the events and my thoughts on that particular day. It was the day before Thanksgiving, 1989. This was the era before smart phones or the world wide web, so it was harder to document things back then. I relied on newspapers, a film camera, and VCR tapes. This year, I have collected these souvenirs to post here. If you missed it, Part 1 of this series, "Before the Show," explains how I got to this point. Part 3, "Aftermath," will follow in the next month or so. I knew that the Pasadena Star would be printing my story that morning, so I picked up a copy at the newsstand. Like the Rapid City Journal, I was on the front page! 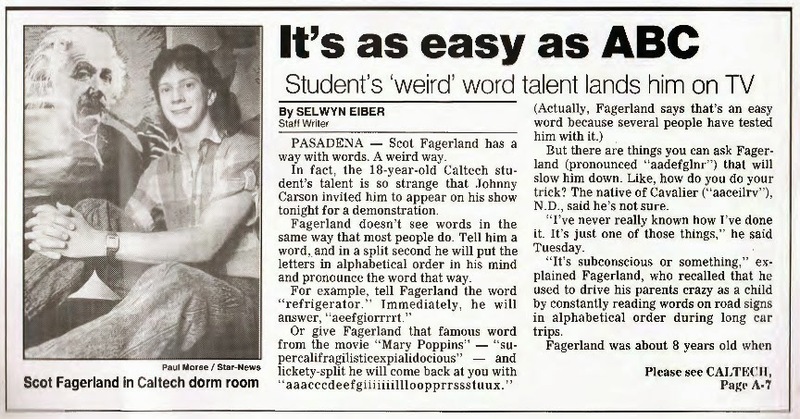 I referred to this article on air, quoting the statistic that 80% of persons with similar talents are mentally deficient. Click here to see the entire article. I was allowed to bring three guests to the taping of the show. It all happened too quickly to get my parents to fly out. I invited three new college friends, all from LD Alley in Ricketts House -- Jen Dooley, Chad Roberts, and Erik Taylor. Mid-day, a limousine picked us up from campus. (Why didn't I get a picture of that?!) NBC Studios were in Burbank, only about ten miles from school. On site, I was shown to my dressing room and then taken into make-up. before I went on Carson. 11-22-89." 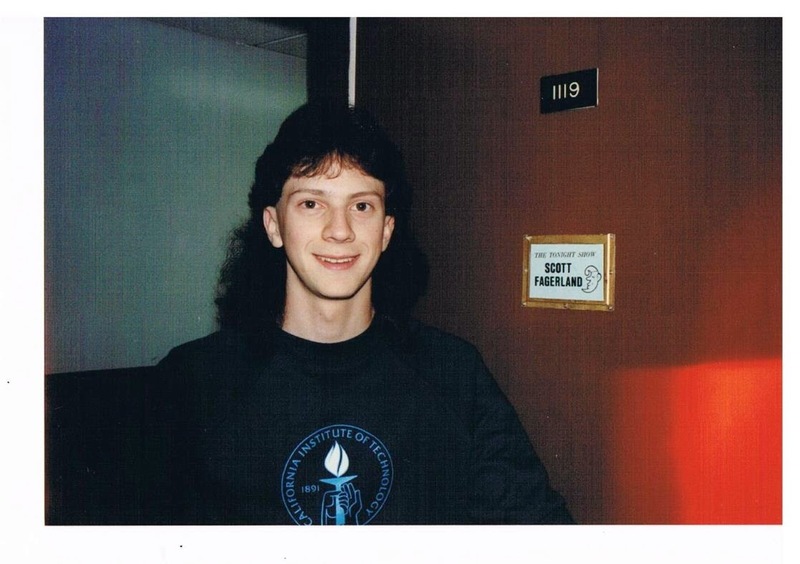 You can see that I wasn't the only crazy long-hair in 1989! 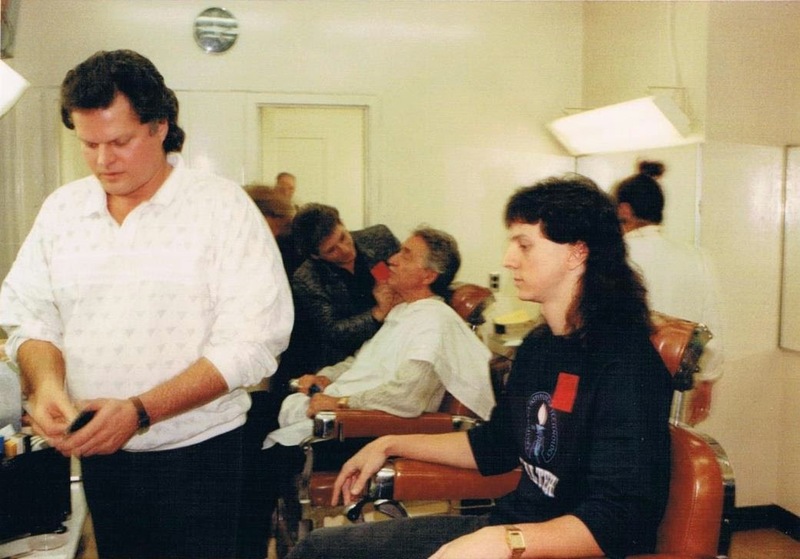 Written on back: "Makeup before shooting The Tonight Show episode I was on. Doc Severenson (sic) is in the seat next to me. 11-22-89." 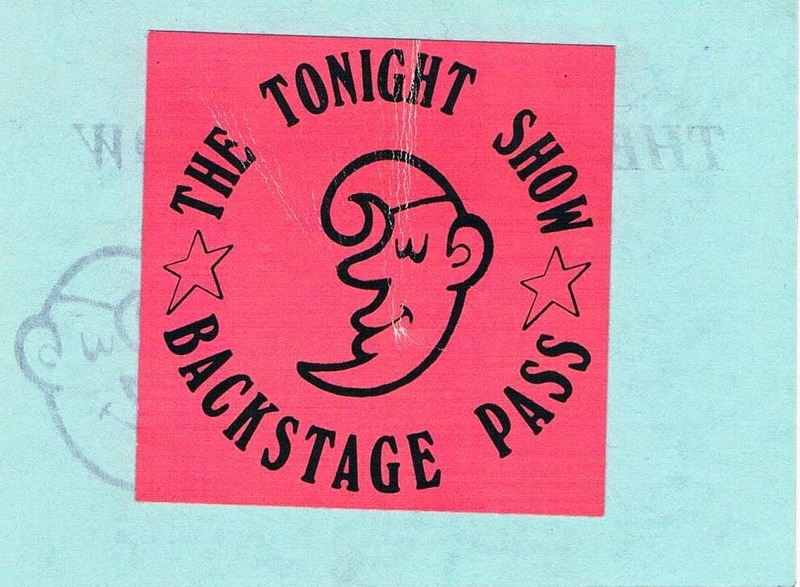 backstage pass sticker (both in photos above) as souvenirs. As a "civilian" (non-celebrity) guest, I was scheduled at the end of the show. If the celebrity guests ran overtime, then I would be bumped to a later date. Thus, I had to wait backstage during the taping of the entire show. Dolly Parton was the main star of this episode. I saw a little bit of her backstage but didn't talk to her. I watched the monitors and laughed as Johnny Carson "over-introduced" me in his monologue. I appreciated the attention, and I thought that it might give me something to joke about if the opportunity presented itself. That helped me feel a little less nervous, but I was nervous nonetheless! I anxiously nibbled on grapes and cheese. Despite Dolly's song and long interview, there was still time left over for me. At long last, I heard Johnny Carson announcing my entrance. When he said my name, it was time to go on. I used to wonder whether Tonight Show guests had to pull back the curtain themselves or if there was a guy back there to pull it for them. That day I found out: there's a guy. He looked at me and pulled the curtain back, I walked through, and there I was in the middle of a TV show. Weird. My parents did a good job of recording and splicing these segments from the show, which include introductions by Ed McMahon and Johnny Carson. Last year, I annotated the clip with text comments and posted it to my YouTube channel. It's pretty self-explanatory now, and it's best if you watch the entire clip (8 minutes). 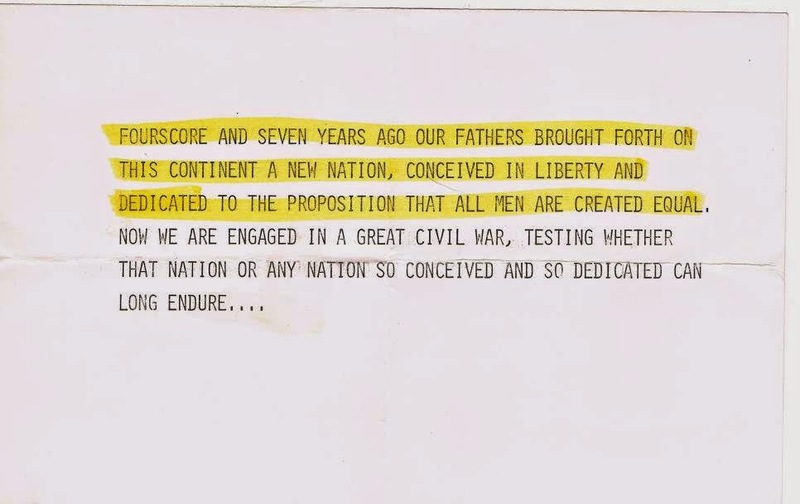 Carson's note card for the Gettysburg address. It took Johnny and me a few moments to get our dialogue into the groove. When I watch it now, though, I feel that by the end we really had a sense of each other and it progressed naturally. I felt that, for a couple of minutes, I was truly "hanging out" with Johnny Carson and Ed McMahon. It was my moment to be part of this great 20th century institution. That's an opportunity I'll never have again, and I'll never forget. 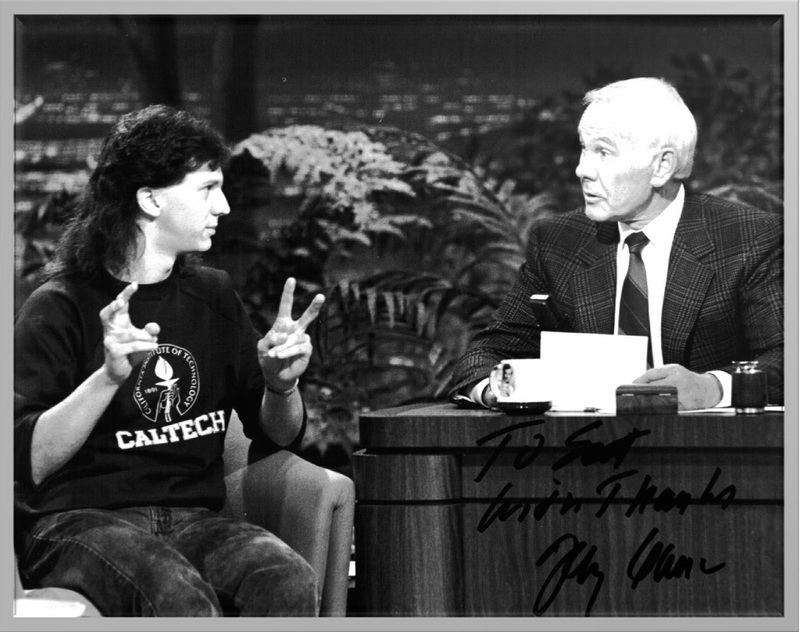 When anyone asks what this ridiculous talent is good for, that's my best answer -- I got to hang out with Johnny Carson for just a little while. The moment was fleeting. When the interview ended, all I had time for was a quick handshake. Johnny went quickly off somewhere, and I never spoke with him again. According to a letter that I wrote to my family two days later, "Right after the show was filmed, I went out to eat with the three friends I had taken. By some bizarre coincidence, there was also a group of four there who had been in the audience, and they were kind of surprised to see me there ('Hey, aren't you that guy?')" 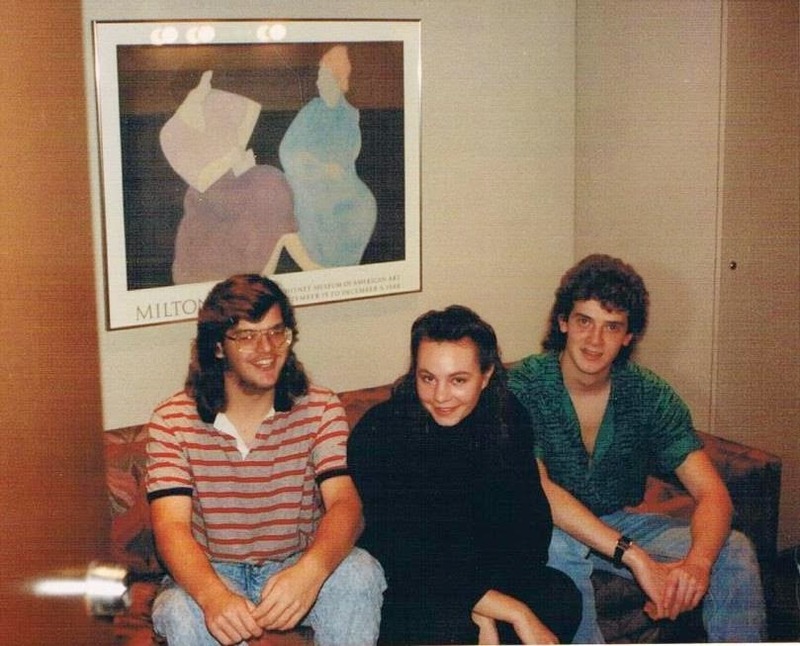 This must have occurred in Pasadena after the limousine took us back, so it really was remarkable to run into studio guests ten miles away and a few hours later. That evening's TV listing in Phoenix's Arizona Republic. I suppose my grandparents sent this to me. John Larroquette was not on as scheduled, but was replaced by a comedienne. The show was shot in the afternoon, several hours before broadcast. By the time it aired, I was back at school, and I got to watch it with my classmates in the Ricketts House lounge. The reaction was encouraging -- laughter and congratulations. I was glad that they liked it, especially when I sneaked in a Caltech inside joke at the end ("DEI," which doesn't really mean much; it's just a symbolic way of saying "Caltech was here.") We recorded it on VCR, and Ricketts House kept that tape. I didn't even have my own copy for decades afterward. There was no party or reception. It was time to go back to ordinary life and get ready for Thanksgiving. I honestly don't remember the rest of that night. I'm sure it felt odd knowing that strangers all across the country had just seen me, and wondering if anybody would notice or care or remember. For that, stay tuned for Part 3 of this series, "Aftermath," to be posted by the end of the year.